I have moved to California from Colorado. I want to change my state for sales tax collection. 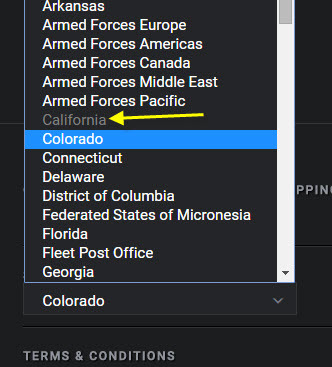 But when I try to choose California, the name is insensitive. What shall I do? California is one of the states where SmugMug will collect tax and pay it to the state. No need for you to worry about collecting or paying tax! SmugMug is HQ'd in California.